The month of March and April are exciting months for Shu Uemura. There will be few launches of new products. It's funny how I have never own any Shu Uemura products before. I just don't know why, although I always have the intention to get their eyeliner and cleansing oil. I will review the product individually in separate posts, but for now, let's go through all these new products. I am excited to share it with you so you can check out the products when you pass by Shu Uemura counter. This is a new addition to Shu Uemura's extensive line of cleansing oil. The new POREfinist is the first cleansing oil that able to control sebum, remove blackheads and minimize the appearance of pores. The POREfinist is developed from new technology to create micro-size oil combination. The texture of the product is as fresh as water. Think of this as makeup remover with effective skincare benefits. One of Shu Uemura's best seller was the lightbulb liquid foundation that comes with a special sponge. Now Shu Uemura came up with a compact form which also comes with a unique sponge. The liquid form creates a dewy glow effect, while the compact form creates a porcelain glow. The coverage is light to medium. I will update a more in depth review on this soon. So far, so good. I'm liking the silky smooth texture. I love the name! It sounds so refreshing and delicious... The Tint in Gelato is a lip & cheek tint. The texture is matte but creamy. It glides smoothly on the lips and easily blend out when applied on the cheek. The color is buildable so you can control the intensity of the color. Will also do a review for this so you can see the product in action. 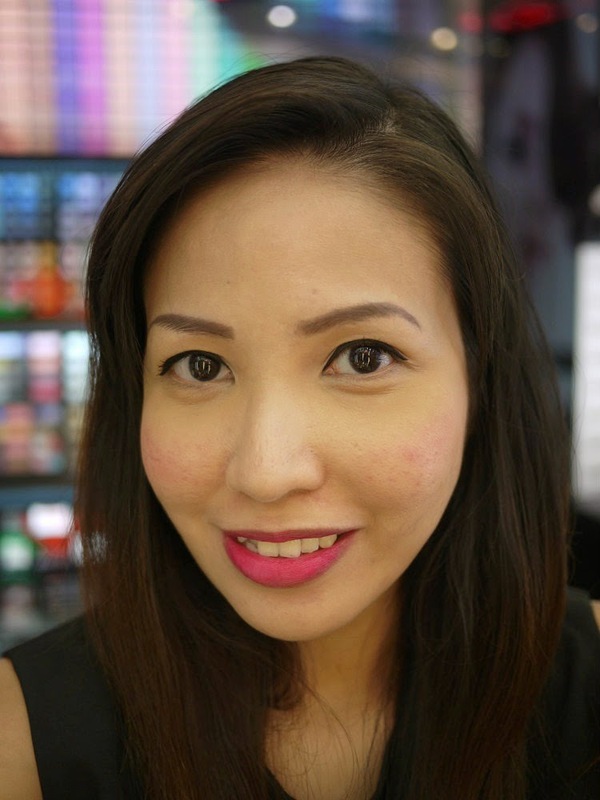 My look, created from the Lightbulb compact and Tint in Gelato with the help of Shu Uemura's elite makeup artist. Are you a fan of Shu Uemura? If yes, do let me know which product you love and what I should try. I'm beginning to explore more products from Shu Uemura and can definitely use some help from you girls. Do drop by Shu Uemura counters whenever you pass by and check out the new products. I'm loving all of it, especially the POREfinist. i've been wanting to try the cleansing oil for so long! And the ads just drive me even crazier! I need to finish up all of my makeup removers before purchase this one. please do a review tau! thank u!!!!! I nak baca! @wiida Ribbon: OK boss! I will speed up the review.